CORA Staunton collected 1-7 as five-time winners Carnacon booked their place in a first All-Ireland ladies senior club final since 2013. The Mayo and Connacht champions made a potentially tricky All-Ireland semi-final against first-time Ulster winners St Macartan’s look relatively straightforward on Sunday, in front of a big crowd at Fr. Hackett Park, Augher. 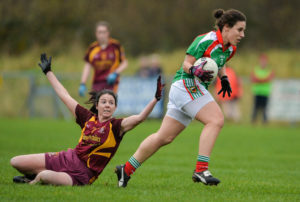 Carnacon were driven forward by their county stars as Fiona McHale delivered another powerhouse performance at midfield, while Amy Dowling scored 1-3 from play. Carnacon, despite coughing up some chances, were generally tight and compact in a defence led by Martha Carter and Marie Corbett. Martha Carter starred in the Carnacon defence. And wing-forwards Louise Dowling and Aoife Brennan, who scored a point each, covered every blade of grass as Carnacon set up a December 3 final clash with Cork’s Mourneabbey at Parnell Park. It’s the first time that the clubs will have met in the senior championship – as Carnacon look to collect a first All-Ireland crown since their last win five years ago. For St Macs, this was a bridge too far but the club managed by former Tyrone All-Ireland winner Ryan McMenamin can still reflect proudly on a landmark season. McHale picked up possession around midfield and drove at the heart of the St Macs defence, with team-mates making intelligent runs on either side to clear a path. Fiona McHale scored a brilliant first-half goal for Carnacon. McHale’s finish was low and decisive and the St Macs luck was summed up in the 28th minute when skipper Joline Donnelly clipped a shot off the upright, across the face of goal and wide. Indeed, St Macs went without a score from the 15th minute until five minutes into the second half, and Carnacon were well in control by then. From there until the finish it was simply a matter of keeping the scoreboard ticking over for Carnacon, as their goalkeeper Michelle Higgins preserved a ‘clean sheet’ with an excellent late save to keep out Lynda Donnelly. Scorers for Carnacon – C Staunton 1-7 (1-5f), A Dowling 1-3, F McHale 1-2, L Dowling & A Brennan 0-1 each. Scorers for St Macs – C Maguire 0-3 (2f), C McCaffrey 0-2 (1f), N McGirr, L Donnelly & C McQuaid 0-1 each. Carnacon – M Higgins; S McGing, M Carter, S Larkin; M McGing, M Corbett, D Hughes; F McHale, E Flannery; L Dowling, A Dowling, A Brennan; E Cosgrave, C Staunton, B Bruton. Subs – M Larkin for Bruton (51), A McHale for S Larkin (53). St Macs – N McKenna; S McQuaid, M Donnelly, M Treanor; S McCarroll, N McGirr, L Donnelly; M McMenamin, C McQuaid; S McRory, C Maguire, P Donnelly; S McGirr, C McCaffrey, J Donnelly. Subs – T O’Hagan for P Donnelly (45), G McKenna for McRory (54), K Irvine for S McGirr (56).